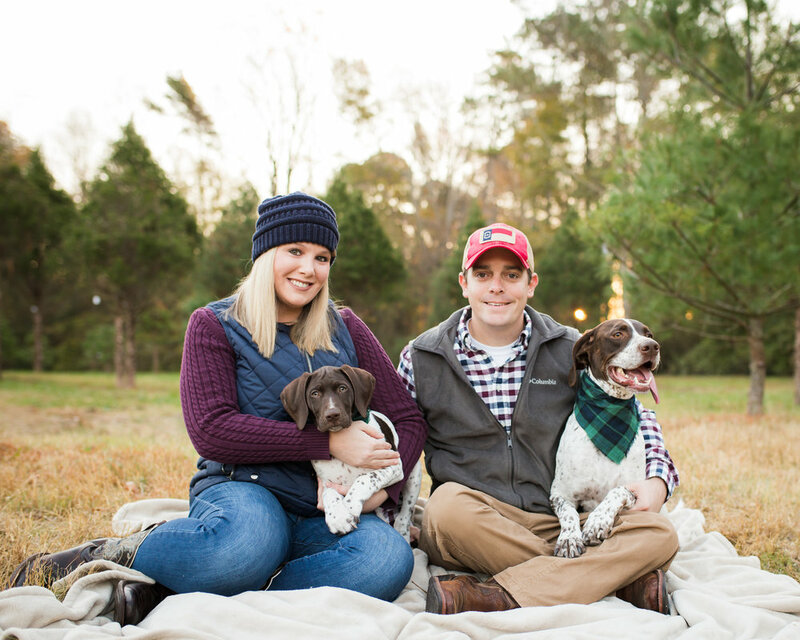 Ashley, Eric, Sampson, and their newest addition, Sir Winston joined me at Back Achers Christmas Tree Farm in Raleigh NC for their first Holiday Portrait session as a complete family! These guys are just a good looking group! Winston has been with the family for a couple of months and is learning so much from his brother Sampson. Ashley and Eric are getting married soon and I am just excited about all of it! We had such a great time at the farm! The pups thoroughly enjoyed the wildlife and, of course, the birds. 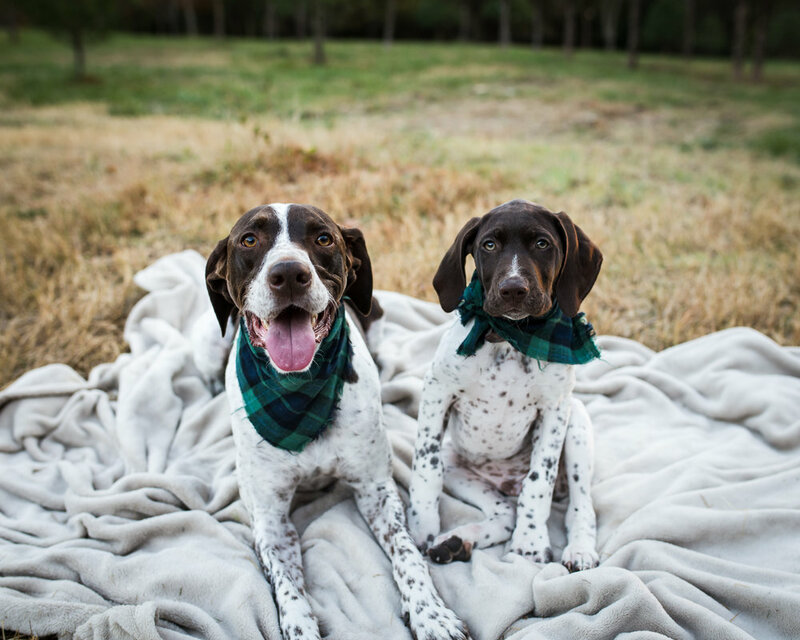 German Shorthaired Pointers, or GSPs, are a hunting and sporting breed and if you look closely at some of the portraits, these guys are clearly on top of their game. We would be taking pictures and all of a sudden, they would both look in the same direction, signaling that their was a bird (or anything flying really, seriously, I have witnessed Sampson pointing at a moth haha) in the immediate area. Enjoy this session and please be sure to leave these guys some love in the comment section! Clearly, Winston's little legs are holding him back from keeping up with his big brother, but here in a few months these two are going to be quite the bird catching duo! I just can't with these two! Sampson clearly found something interesting and Winston wants in, but those ears and that cute little tush! AH! I am imploding with girl squeals! Time to let mom and dad share some of the spotlight. Ashley and Eric are getting married next year at the Leslie-Alford-Mims House in Holly Springs NC. We took sometime to capture these two and all of their love. I am wishing them the best life together! These two are just too much! Not only are they future hubby and wifey, they are clearly best friends. Everyone should want a love like this! This really is the most wonderful time of the year! I love doing these portraits and I love this Christmas Tree Farm! Be sure to check out Back Achers Christmas Tree Farm for your fresh trees and if you want to book me for a session, let's chat!